Yes, of course I have a second stomach just for dessert. What a silly question…. To continue our 4th of July eating experience . 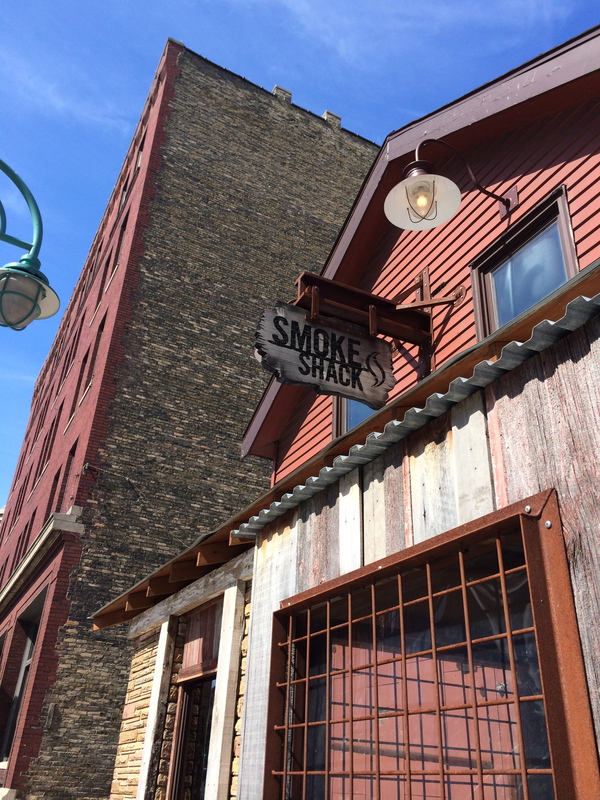 . . our dinner stop was the infamous Smoke Shack…. 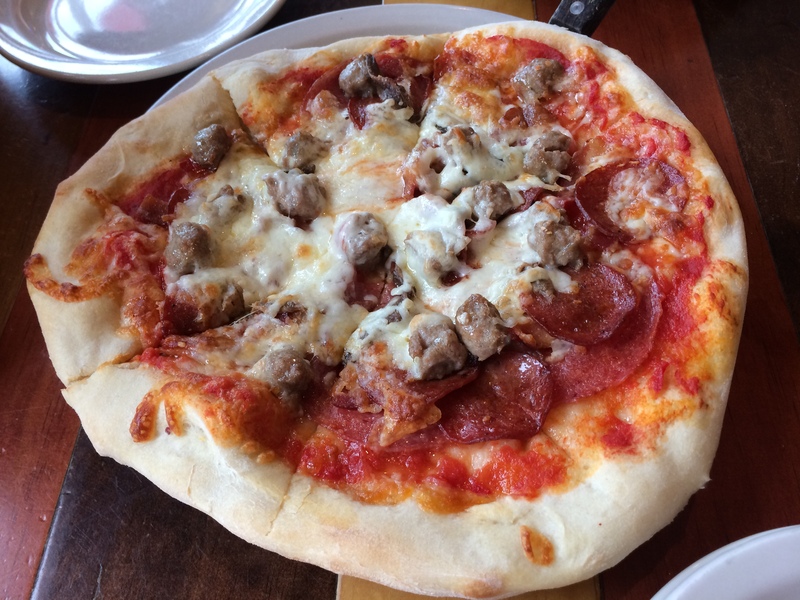 While I have been cooking, documenting, and blogging away in Miami, I have constantly been encouraging Brian to send me pictures of the meals he cooks in South Bend. I have never failed to be impressed, and have thus grown increasingly curious to try one of his home-cooked meals (especially after being reassured what a great cook he is by one of his friends). Since we had planned to go out for a couple of meals, this left us with breakfast as the meal to cook at home. Remaining as impartial as possible, I concede that Brian makes a much better breakfast sandwich than I do. I’m only lucky that I wasn’t in South Bend long enough to be asked to make one. 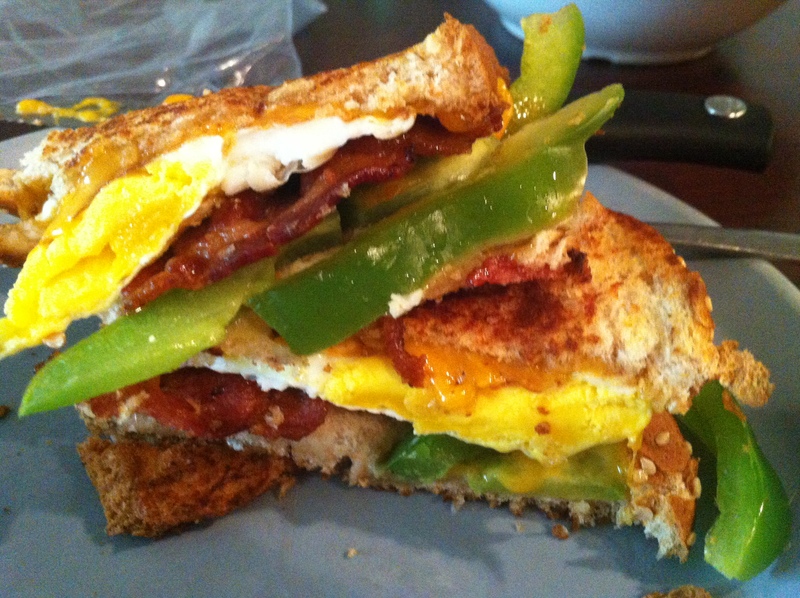 The sandwich included eggs, bacon, cheddar cheese, green peppers, and some Cholula hot sauce on the side for dipping. The eggs were cooked just past over-medium so that the yolk wasn’t runny enough to make a mess, while the bacon was fried to the perfect point between chewy and crispy. As a final touch, the bread was buttered and grilled to what my dad and Alton Brown would call GBD or “golden brown and delicious”. After returning to the kitchen later in the morning and smelling the salty home-cooked smell of real bacon that was reminiscent of breakfast, I realized that this sandwich is one that I would enjoy at any time of the day, not just for breakfast. What better way is there to start off the 4th of July than with a Bloody Mary at brunch? 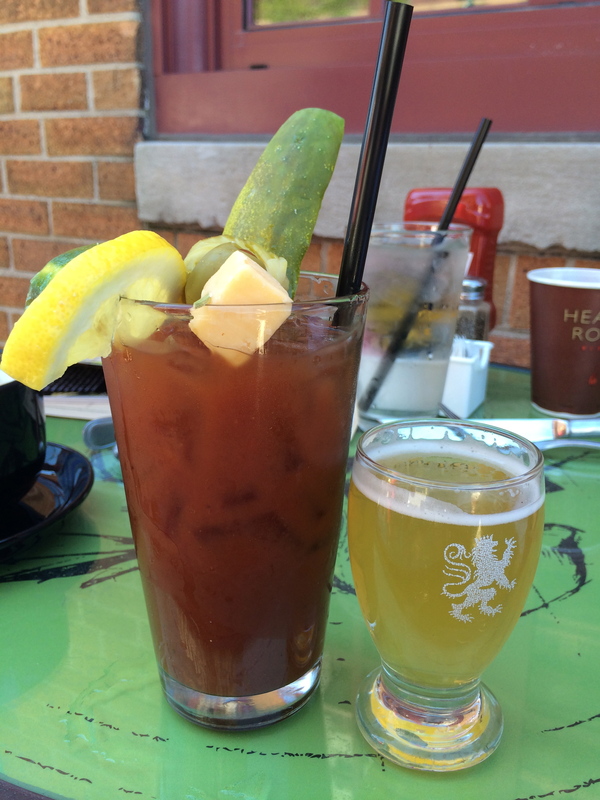 This one was probably the best Bloody Mary I have ever had…. To celebrate the Fourth of July this year our whole family congregated in Milwaukee. Our first reunion event was, of course, dinner. Mom’s research brought us to Pastiche Bistro and Wine Bar, a “ten-table neighborhood restaurant” featuring traditional French dishes with locally-sourced ingredients…. Somehow over the course of a week I manage to acquire many different kinds of produce. Maybe I need a specific fruit or vegetable for a dish, maybe it’s on sale, or maybe I just have a craving for it. Nonetheless, I sometimes find myself looking in the fridge and feeling nearly overwhelmed by the variety of goodies I have collected over the week. In order to decrease food waste, I’m always looking for “multi-purpose” or “everything-but-the-kitchen-sink” meals that I can adapt according to what I have on hand. Three such meals include an omelet, fried rice, and slaw salad. Since I started really cooking for myself in the Fall I’ve realized how much of an omelet snob I am. I can say with perfect confidence that the best omelets I’ve ever had in my life were made by my mom. I would gladly give up an omelet made with veggies, ham, cheese- the works, for a simple egg and cheese omelet made by my mom. Even Brian can attest to this since he ate one (or maybe two or three) of them last summer. At the office there is a great $3 omelet deal that many of the interns love, but in my opinion it really doesn’t compare. On this evening, I recreated one of her omelets by beating two eggs together with a small splash of milk and some black pepper. After the pan got hot, I poured the eggs in, ever so slightly pushing them around as if to scramble them. The key is to get some volume or scramble to the egg while it’s still uncooked enough that the excess beaten egg will fill in the holes and maintain the egg coverage of the pan. Just before folding, I add toppings I choose and a slice of cheese. All it takes is a little patience in folding and flipping the egg and voila, the perfect omelet. The second of these multi-purpose meals is fried rice. I always try to add some kind of protein to the rice, so on this occasion it was canned tuna. All I did was stir fry some kale, mushrooms, carrots, red bell pepper, and green onion together with garlic, mirin, and soy sauce. After all the veggies were tender I added leftover brown rice I had defrosted, the flaked tuna, and a tiny bit of sesame oil. 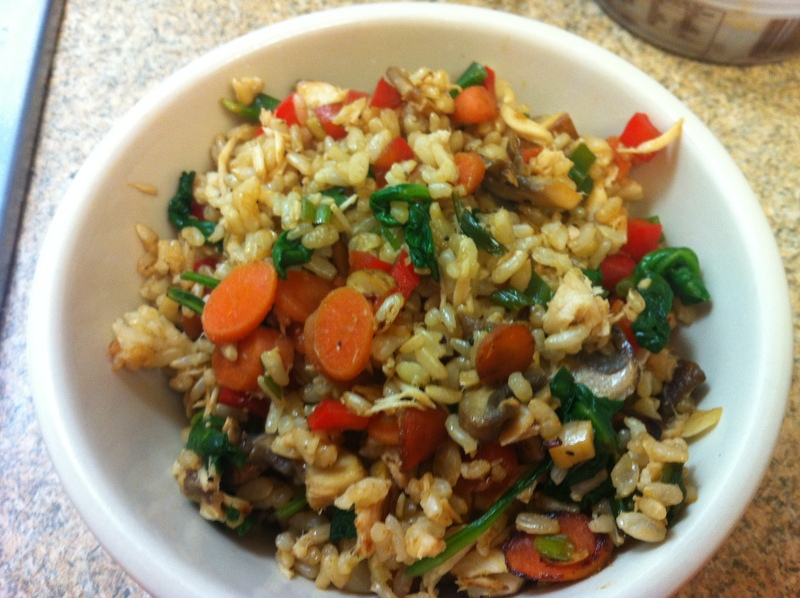 This really is a “one bowl wonder” kind of dish- you have your good carbs, vegetables, and protein all together. Since I remembered that I had some nori (salted seaweed) on hand, I ended up eating my tuna fried rice “sushi style” in the sense that I made little nori and fried rice rolls. Finally, my broccoli slaw salad ended up being a means for me to use up some Greek yogurt that I needed to eat. While most broccoli slaw salads use a mayonnaise dressing, Greek yogurt has become a popular substitute. 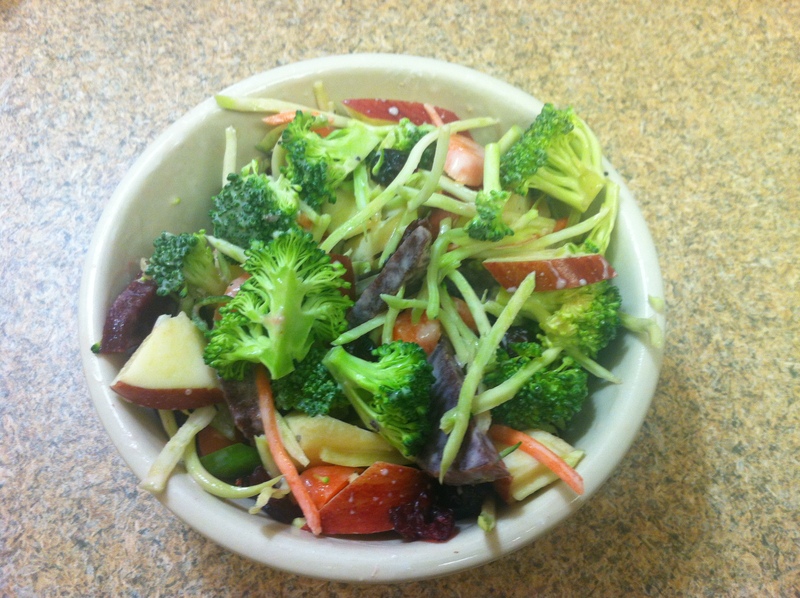 The produce part of the slaw included packaged broccoli slaw, sliced beets, raw broccoli florets, chopped apples, craisins, and carrots. Although I didn’t have the traditional apple cider vinegar for the dressing, I instead mixed the plain non-fat yogurt with a bit of rice wine vinegar, black pepper, and orange juice. Although it sounds like a very odd combination for a dressing, I assure you that it brought all the veggies together nicely. It was tart, clean, and sweet, with a much lighter feel than a mayo based slaw. I’ll admit that these throw-together meals are not always the most aesthetically pleasing or traditional dinners one could make during the week, but they are functional for sure. When you’re cooking for one it sometimes gets tricky when you can only consume your produce so fast and you can only buy so little in quantity. That is where these simple meals come in handy. I’ve come to realize that when I’m only cooking for myself I can afford to make sacrifices on elegance for functionality. After all, how can I complain if it tastes good and wastes less? This past weekend some of the interns and I decided to bypass South Beach and head straight on through to Lincoln Road, a cross between an outdoor mall, farmer’s market, food festival, and quaint town center…. Perhaps one of the most common entree salads that has appeared on menus within the past several years is some adaption of a Chinese Chicken Salad. The combination of the rising popularity in Asian fusion cuisine and the sweet, crunchy, and satisfying qualities of this type of salad have allowed it to find a place as a salad “classic”. This Saturday after spending a wonderful but exhausting afternoon on a boat at a sandbar in Miami, I reached the peak of cooking laziness and ordered Chinese take out. To be perfectly honest, it was terrible (maybe due to the nonexistent Asian population in Miami). However, I did manage to scavenge a packet of crispy noodles bits that I knew could potentially serve as the finishing touch of a Chinese themed salad. By saving these crispy noodles and buying a few more key ingredients at Publix, I managed to whip up what turned out to be large and flavorful Asian Salmon Salad. 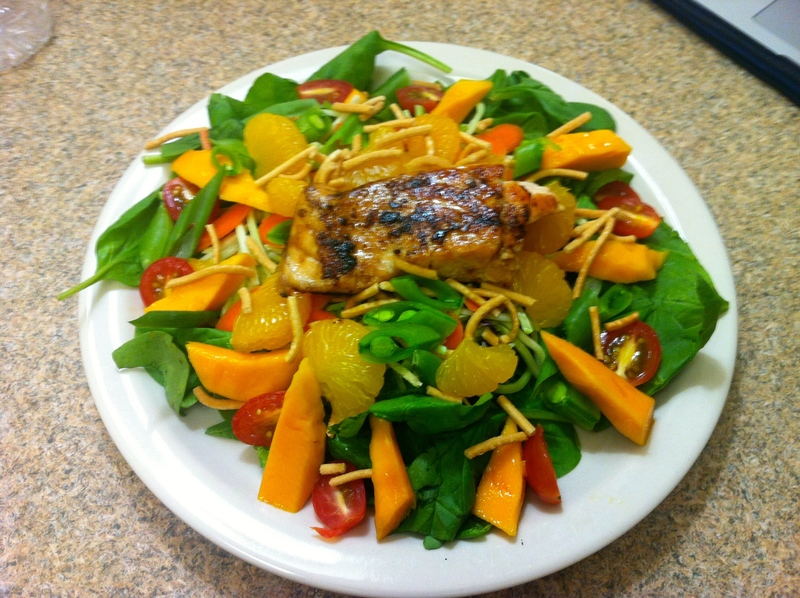 The base of the salad and veggies included a bed of spinach, tomatoes, carrots, sugar snap peas, green onions, mandarin oranges, and champagne mangoes I purchased at the farmer’s market. I then sautéed the salmon with a bit of soy sauce and garlic. Just as the salmon finished cooking, I topped the hot fish with a small spoonful of brown sugar, flipped it over quickly, and let it caramelize into a nice crispy crust. I made the dressing entirely from eye and taste so I truly have no idea what the ratios of ingredients were. Nevertheless, I included sweet rice vinegar, soy sauce, a splash of sesame oil, some of the leftover liquid from the mandarin oranges, garlic, sriracha, and finally some blue agave and orange juice to add some sweetness. The sweet mandarin oranges and slightly tart mangoes provided a good contrast to the spicy Asian dressing (I had somewhat of a heavy hand with the sriracha). Although this dish requires a good amount of produce variety, it is definitely worth the effort when it all comes together- much more satisfying and healthy than mediocre Chinese take out. 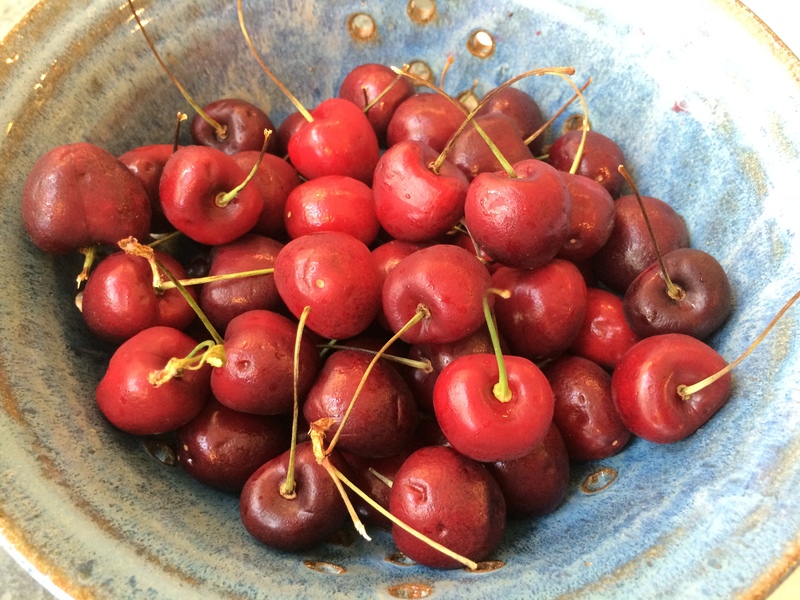 There was a bowl of fresh cherries sitting in the fridge, and I knew I had to use them asap. Whatever I was going to make, I knew I’d have to remove the pits . . . without a cherry pitter. Well, I got it done, eventually. 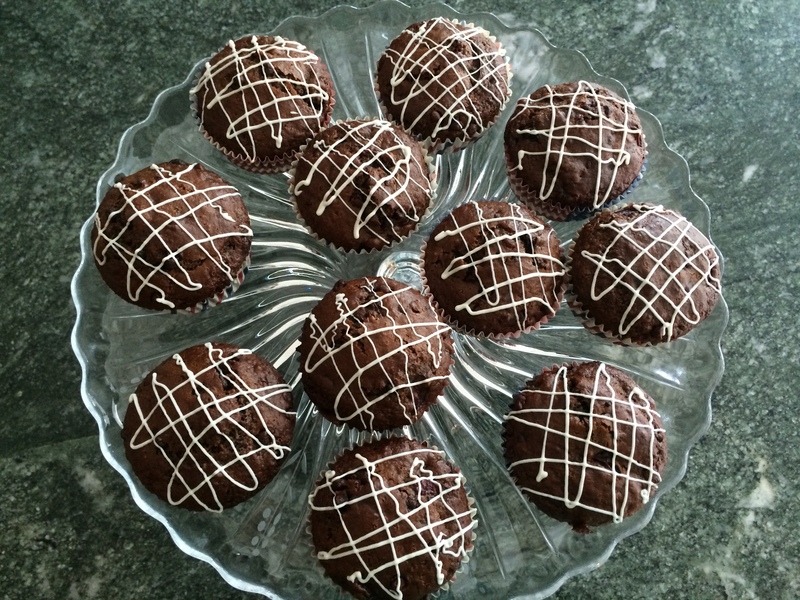 I decided to try to make chocolate cherry muffins. Christine was always a huge fan of chocolate cherry bread when we were growing up, so I thought it would be nice to recreate it in a more accessible form (as in not a huge loaf). I used this recipe from All Recipes. 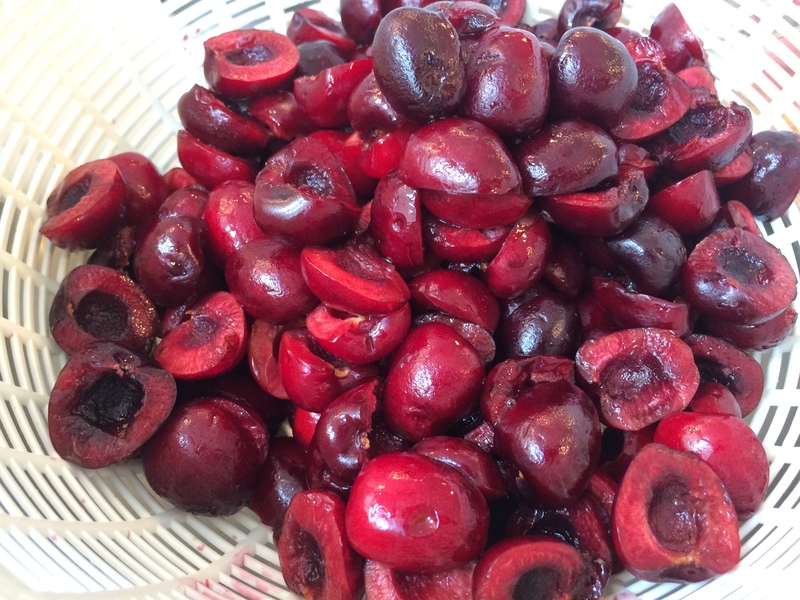 The priority in finding a recipe was that it would use fresh cherries instead of dried cherries. Also, the recipe called for sour cream, but I didn’t have any so I had to substitute with a mix of yogurt and baking soda. I also thought it would be nice to add a white chocolate finish on top. I just melted some white chocolate in the microwave and drizzled it on top. The chocolate warm and comforting, and the cherries were soft and sweet. A success.